Spooly, a collection of tangle-free, durable, magnetic and incredibly portable charging and data transfer cables featuring the first ever Mag-System are now on Kickstarter. Whether you’re charging your devices at home, at your desk or on-the-go, Spooly is the only charger cable you’ll ever need. Bulky, tangled and damage prone charging cables could be a thing of the past with Spooly. These full-length charging and data transfer cables offer users the reach and flexibility they seek, both at home and work. Spooly is also perfect for on the go charging as its incredibly portable design takes up virtually no space and eliminates, knots, tangles and frays. They can easily be rolled up and carried in the pocket and simply pulled to unwind. Spooly’s first of its kind Mag-System enables the magnetic cable to wind around quickly and effortlessly around the connector to form a perfect and secure coil. The charging cables incorporate magnetized barium ferrite particles that also provide excellent insulation. The ultra compact and pocket-sized Spooly packs a punch. Featuring both reliable charging and data transfer, it is extremely feature rich. Linear cable orientation and rounded edges to minimize wear and tear of the internal wires when coiled, magnetic fastening and reversible USB for enhanced convenience, cables bending along the natural curve of the wires and more – these charging cables have it all. They are also USB-IF certified and are supported by Windows, Google, and Mac operating systems as well as many device manufacturers. “Whether you’re charging your devices at home, at your desk or on-the-go, Spooly is the only charger cable you’ll ever need. We wanted to eliminate all the frustrations and turn the charger cable into an enjoyable product and Spooly truly reflects that,” said designer and inventor Scott McCormack. 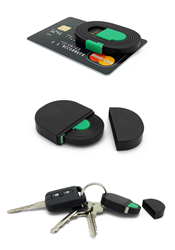 Spooly can be stored in injection-moulded USB casings made of a thermoplastic PC and ABS blend. The superior build quality of these ultimate charging cables that are manufactured using highly flexible and robust thermoplastic elastomer (TPE) perfectly complements their numerous features. 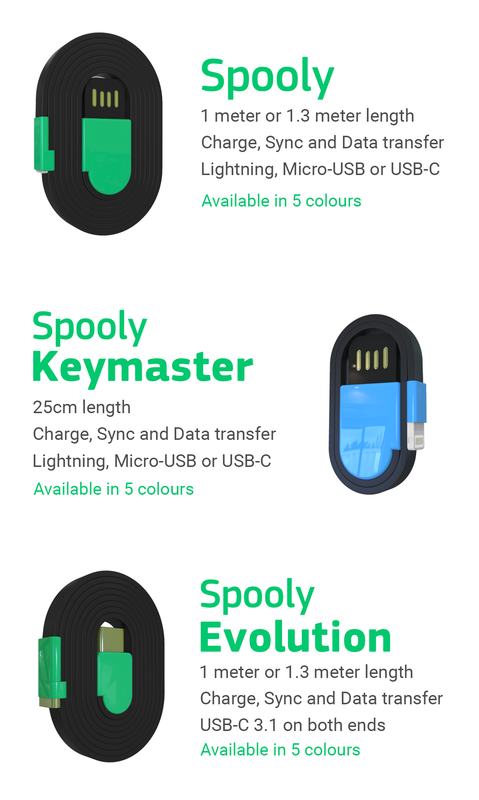 Spooly is available in 25 cm (Spooly Keymaster) and 1-meter and 1.3 meter variants (Spooly & Spooly Evolution) that come with a key ring and form fitting cases and in a wide range of colours, with a special green and black edition available exclusively for Kickstarter backers. Spooly is a small innovative company with huge ambition, dedication and determination. Founder Scott McCormack has over 18 years expertise in product design, electrical and mechanical engineering. Extremely passionate about innovation and engineering, he invented his first product at 17 – an electronic and biometric security lock powered by kinetic energy.